Don’t panic. Shopping for malpractice insurance may not be as hard as you think. Here are some tips from several experts. Insurance is a fact of life: Health insurance helps pay the bills incurred during a medical emergency. Automobile insurance helps you get back on the road after an accident. Homeowners insurance gives you the peace of mind that your belongings can be replaced in case of a fire or a burglary. But are you adequately protecting your career as a social worker? Although social workers rarely attract attention-grabbing lawsuits, the risk of financial and professional ruin still exists. The best protection may be to purchase malpractice coverage. The good news is that malpractice coverage is relatively affordable. The bad news is that thinking about insurance—let alone shopping for it—can seem like a boring chore. But there are ways to make the process go more smoothly. The following tips are compiled from information provided by Reamer and several other observers of the malpractice market. A major mistake people make when shopping for malpractice coverage is assuming they don’t need it. There are many types of social workers other than those in private practice who could benefit from coverage, Reamer says. For example, social workers employed in agencies often believe they are covered by their agencies’ policies. That may be true—to a point. Such coverage is there to protect the agency, and a social worker’s interests may fall by the wayside when the agency faces legal action, says Tony Benedetto, executive vice president of NASW Assurance Services, Inc., a subsidiary of the National Association of Social Workers. Social workers at risk of being subpoenaed as part of custody battles, workers compensation cases, or other legal proceedings and those who provide consultation or supervision should also consider insurance, Reamer says. Students in field placements and faculty at schools of social work should make sure they have adequate coverage, too. “It’s important to have both an umbrella and a raincoat,” Reamer says. Malpractice coverage comes with two liability limits. The per-claim limit is the maximum coverage you will have for any single claim. The aggregate limit is the maximum coverage you have for all claims covered by the policy. Social workers working with managed care organizations and other third-party payers are typically required to have a policy with coverage of at least $1 million per claim and $3 million aggregate, says Margaret Bogie, a licensed insurance broker and consultant based in Chantilly, VA. This is sufficient coverage for most social workers, and providers considered lower risk or who are covered under an agency policy may be able to get by with even less coverage, Bogie says. There are two types of coverage available to social workers and other mental health professionals: claims-made and occurrence. A claims-made policy will provide coverage for alleged actions that occur during the time the policy is in effect as long as the policy is still in effect when the claim is made. The pricing for such a policy is stepped, meaning the annual premium is deeply discounted at first and will go up each year for several years to a point where the policy reaches maturity and rates level off. An occurrence policy will provide permanent coverage for claims relating to actions taken during the policy period. Which type of coverage is best? Each has its advantages and disadvantages. The long-term protection provided by occurrence policies is good because many claims come several years after the alleged wrongdoing. However, claims-made policies are less expensive; the cost of such a policy when it matures is typically about 80% of the annual premium for an occurrence policy, Bogie says. She recommends purchasing tail coverage if you choose a claims-made policy and later decide not to renew it. Tail coverage will continue to cover claims for actions occurring during the policy period. If you share space or work with other providers, you may want to look into a group policy. Such a policy may be more economical, but it could come with restrictions that you don’t want, Bogie says. For example, a group policy may not cover you when you work outside the group setting. If you do choose a group policy, Bogie recommends looking for one that offers severability of limits. That means each person covered under the policy has separate liability limits, not shared ones. You don’t want to be stuck facing a claim that your insurance company can’t pay. That’s why it’s important to research the insurer’s financial strength before buying a policy, Benedetto says. You can do that by dealing only with carriers with “A” ratings from an organization such as A. M. Best. Looking for such ratings will help ensure a carrier has adequate resources to pay claims and large enough reserves to survive a rash of claims. Historical stability is important, too. An insurer with a proven track record is more likely to stick around and have the perspective needed to weather storms in the marketplace, Reamer says. There aren’t a plethora of companies that offer malpractice insurance for social workers. Among the organizations that do are NASW Assurance Services, Healthcare Providers Service Organization, and CPH & Associates. These and other carriers often try to differentiate themselves by offering extra features with their policies. Some of these extras could help you choose one policy over another. One especially important extra is licensing board coverage, which will help cover your legal expenses in case you need to defend yourself against complaints filed or disciplinary action taken by a board. Such complaints are more common than lawsuits, and your inability to afford adequate legal counsel could cost your license and your reputation, says David Wolowitz, an attorney with McLane, Graf, Raulerson & Middleton, a law firm with offices in New Hampshire and Massachusetts. “Social workers are not wealthy people, and I’ve seen people give up their licenses rather than fight a complaint because they couldn’t afford legal expenses,” Wolowitz says. Bogie says other extra features to consider include premise liability, which covers trips and falls occurring in your office space, and coverage for income you lose while attending court and depositions. Many carriers offer premium discounts for part-time practitioners, first-year practitioners, and others meeting certain criteria. It also may be important to find out whether a carrier makes you pay your premium all at once, quarterly, or semiannually. And don’t forget customer service, Benedetto says. Look at how easy or difficult it is to pay premiums, renew policies, and contact the company with questions. For some social workers, even the thought of shopping for malpractice insurance invokes anxiety about lawsuits, court proceedings, and big payouts. Yet the truth is social workers are at relatively low risk of getting sued. 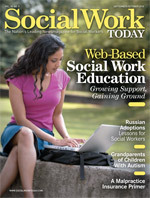 Social workers are considered at lower risk than other mental health professionals such as psychologists because social workers are more likely to be engaged in areas such as child welfare and case management, and only some social workers work regularly with suicidal or other high-risk clients, Bogie says. In addition, the fact that social workers cannot prescribe medications reduces their risk of a lawsuit. Because social workers are at a relatively low risk of legal troubles, it makes financial sense to look for a malpractice policy that covers mostly or only social workers, Benedetto says. The best way to fight lawsuits or disciplinary action from licensing boards is to make sure they don’t happen. Social workers must recognize that the ethics violations that can get them into trouble go beyond sexual relationships with clients and other boundary violations, Reamer says. Problems also can arise over issues as varied as the management of confidential information, terminating services, not reporting abuse to protective services, and using unorthodox treatment approaches. Continuing education requirements can provide social workers with great opportunities to learn more about ethical issues and how to manage their risk, and insurers frequently offer premium credits for social workers who take advantage of these opportunities. The fact that most states require ethics courses as part of their continuing education requirements and that the Council on Social Work Education has required more ethics education in schools of social work are encouraging signs, Reamer says. “That more ambitious approach, I feel, is bearing some fruit,” he says. Many social workers purchase malpractice insurance to protect themselves from lawsuits, but getting sued may not be their biggest concern. Social workers are more likely to face disciplinary actions from licensing boards, according to observers. And complaints filed against social workers require the same serious response as lawsuits because of the career damage complaints can inflict. The ASWB collects data on disciplinary actions from social work boards in 49 states, Washington, DC, and the U.S. Virgin Islands. And the number of disciplinary actions reported has risen steadily over the past two decades, Hymans says. But the increase doesn’t necessarily mean social workers are acting more unprofessionally than in the past. Stronger regulation of social work and the relative ease of filing complaints are more likely culprits, Hymans says. Once a complaint is received, a licensing board will determine whether there are grounds to investigate. The results of that investigation can lead to various disciplinary actions, including sending warning letters, arranging consent agreements, or calling formal hearings. It’s a good idea for social workers to seek legal representation during these proceedings, says Frederic G. Reamer, PhD, a professor at Rhode Island College’s School of Social Work. That is why it’s so important for social workers to ensure they have malpractice insurance that covers such legal expenses, he says. There are many options for social workers seeking attorneys to defend them from licensing board complaints, says David Wolowitz, an attorney with McLane, Graf, Raulerson & Middleton. Malpractice insurers sometimes can provide lists of attorneys they work with regularly. Another approach is to seek recommendations from other social workers, from local chapters of the National Association of Social Workers, or from other professional organizations.